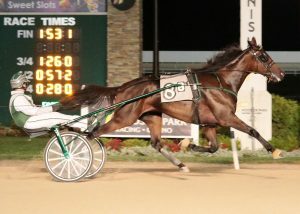 Katkin American continued his winning ways Thursday, Oct. 4 in the $75,000 Indiana Sires Stakes final at Hoosier Park. Driven by James Yoder, the sophomore trotting gelding rounded the oval in Anderson, Ind. with the mile in 1:53.2. Starting from post eight, Yoder had no choice but to send Katkin American, the heavy favorite of the field, to the front. River Otter and Robert Taylor beat the duo to the punch, keeping them outside until past the quarter mile marker in :28.0 before Katkin American cleared to the lead. The tempo of the race slowed just a bit before amping up again around the final turn for the stretch drive. Katkin American held steady on the lead and drew away from the field as he neared the wire. The Guccio gelding ended up with a five-length advantage at the finish line over Got The Groove and John DeLong for second. Admiral Dewey and Trace Tetrick closed well for third. Owned by breeder Brett Boyd Racing Inc. of Michigan, Katkin American now has five wins and five seconds in 11 starts for his career. Unraced at two, the strapping trotter has been conditioned this season by Verlin Yoder, who is a master with trotters. Four of his five second place finishes this season have been at the heels of Fiftydallarbill, 2017 Breeders Crown winner. Fiftydallarbill skipped the Indiana Sires Stakes final to compete in the Kentucky Futurity at The Red Mile Sunday, Oct. 7. Fiftydallarbill, trained by Bill Crone and owned by John Barnard, has drawn post six in the first of two $98,000 eliminations for the prestigious event. If he finishes among the top five in his elimination, the Indiana-bred son of Swan for All, who will be driven by Brett Miller, will return for the $434,000 final slated as the 13th race on the program with an estimated post time of 4:48 p.m.
Trainer Jeff Cullipher will also be featured on the Kentucky Futurity card at The Red Mile Sunday, starting his impressive race mare Inverse Hanover in the $98,500 Allerage Farms Fillies and Mares Open. The race is slated as the 12th on the card and Inverse Hanover has drawn post one in the seven-mare lineup. Matt Kakaley is scheduled to drive the Somebeachsomewhere four-year-old who finished third in her last start at Hoosier Park in the Fillies and Mares Open Pace.